At around 3.30am on 10th November 2018, a group of 20-25 settlers armed with guns entered the town of Kufr al-Dik, in the Salfit area of West Bank, vandalising property and making death threats. 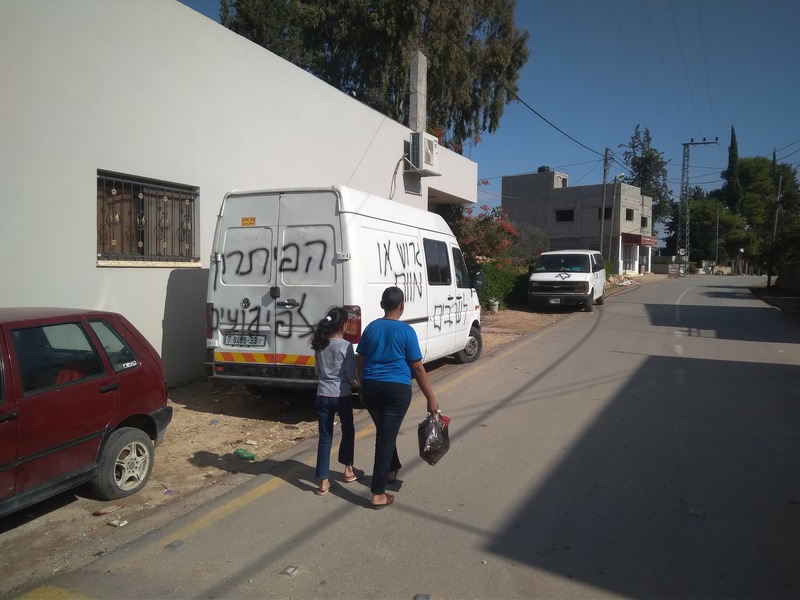 IWPS volunteers took pictures of the graffiti on a van, a roundabout, and walls including a wall next to the girls’ school in Kufr Al-Dik which contain vulgar threats in Hebrew. 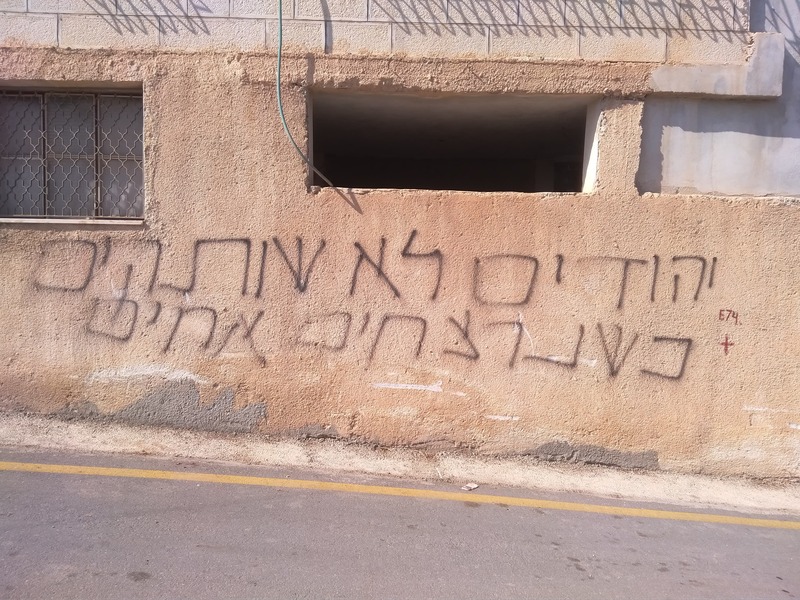 The words spray painted in the town in Hebrew include ‘Arabs must be deported or killed’ and ‘Jews don’t keep quiet when brothers are murdered’. Seventeen cars were vandalised, with tyres being slashed by the settlers. Witnesses of the incident include a driver from a different town picking up workers for the day and a 4 year old girl who was too scared to mention anything to her parents until the following morning. The pattern of recent attacks in different areas suggests that this could be an organised group of settlers, the perpetrators not necessarily coming from one particular settlement close by to Kufr Al-Dik. IWPS met with Mayor Brahim Elaesa to learn more about the difficulties that Kufr Al-Dik faces from the Israeli occupation and settlers. Kufr Al-Dik is Palestinian town of 6000 inhabitants and is surrounded by 5 settlements and one industrial settlement. A large proportion of the town is in ‘Area C’, meaning that Palestinians are not allowed to build on it, and those that do will meet demolition by the Israeli army. Many agricultural houses and two family homes have been demolished in the past, and currently the owners of 23 houses have received demolition warnings. Sewage from the settlements and pollution from the industrial settlement runs into the rivers and affects the farmland around Kufr Al-Dik, killing plants and trees and jeopardizing the vital source of income for residents, the olive harvest. With pollution and sewage comes a huge increase in mosquitoes, flies and disease. Furthermore, the sewage water attracts wild pigs which are in of themselves a huge problem for the townspeople. Pigs eat farmers’ crops such as beans, grapes and figs, and the increase in the number of wild pigs in the area has made it impossible for local people to plant these crops. They also breed in high quantity, but it is illegal for Palestinians to hunt the pigs. While settlers can construct large fences around their properties to keep out the pigs, Palestinians are forbidden from doing so. Water is a huge issue for the town, and a clear example of the apartheid policies of the Israeli state. All natural water sources in Palestine are controlled by Israel, meaning that Palestinians have to buy water from their occupiers. The amount of water they can use is limited, in 24 hours only 680 cubic metres are given to 11,000 people living in Kufr Al-Dik and surrounding areas. A family of 5 have around half a cubic metre of water per day, barely enough to wash and even more difficult in summer months. The price the residents of Kufr Al-Dik have to pay per cubic metre – 4 Shekels – is nearly double that which settlers pay for the water – 2.43 Shekels. Settlers have no restrictions on how much water they can use. Due to Oslo Agreement rules regarding the administration of different ‘Areas’ of Palestine, Palestinian police are forbidden from leaving their headquarters when the Israeli army or settlers are in the town. This means they are powerless to prevent another incident like this. The defence of the town falls to its people, who did successfully chase off a group of settlers during the last attack which took place inside the town, 3 years ago. At that time, IWPS was told by a local resident, a group of settlers entered Kufr Al-Dik in the daytime and were chased away by townspeople. They later found out that these settlers were studying in University to become Rabbis. Attacks on the residents of Kufr Al-Dik outside of the town walls, however, are more frequent. In the past month, IWPS has been accompanying farmers in Kufr Al-Dik to harvest their olives. It is not uncommon for settlers to threaten, harass or attack farmers whilst they are harvesting, particularly those who own land closest to the land stolen for settlements. IWPS recently wrote about an attack on a family near Bruchin settlement, where settler youth threw stones at the family (including small children) and warned them that if they came back to pick their olives they would kill them. ← Wadi Qana: the ‘Natural Reserve Zone’ that can only be built on by Zionists.